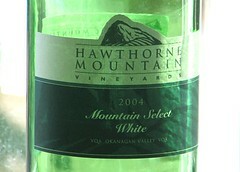 Hawthorne Mountain Vineyards has discontinued our favourite "value-priced" wine. To add insult to injury, I called the winery when I found out to ask if they still had any kicking around. The guy I talked to said, "Well, we've got a few cases of unlabeled ones that were returned from a wedding, maybe $13 for the 1.5l magnums." I told him I'd be there in 20 minutes, and then he backtracked..."just a sec...umm...I'll just doublecheck that they're still here. (30 seconds of silence) Oh, sorry, they're not available." Grotesque tease. Notice that he didn't say that they had been sold; he just wasn't going to sell me any. Anyway, I embarked on a quick research project to track down any of our beloved Mountain White still for sale in the province. Every person at every place I called assumed a furtive tone, repeating the fact it was being discontinued. Several admitted that they still had stock, then caught themselves and went to "check" before returning with the sad news: "Umm...yeah, sorry...uhh...they're not available any more. They're discontinued." I KNOW THAT ALREADY. I could picture every wine store employee writing their names on every remaining case. Finally, my research project hit paydirt -- a friendly place in West Vancouver had 10 magnums left and would hold them for us. Mark agreed to pick up the stash, and Larry and Pearl ended up hand-delivering it to our door a few days later when they returned from the coast. Why all this fuss for cheap white wine? Well, it's cheaper than milk (Editor's note: milk imported by private plane from royal organic Egyptian cows? $10/litre would be awfully pricey dairy, and proves how terrible my math skills are), VQA quality, and it seems to be good with most things...but at some point, I guess it just became a quest.